Signet is a concept men's jewelry online boutique showcasing multiple designers and artisans from around the world. A unique jewelry house that sells special and distinct pieces to enhance a man's look. Signet's goal is to create an enjoyable online shopping experience marketed towards the modern man where one can purchase luxurious and fashionable products directly from the web. Signet sells distinct pieces with an emphasis on elegance. Our aim is to make men’s jewelry the new it thing. 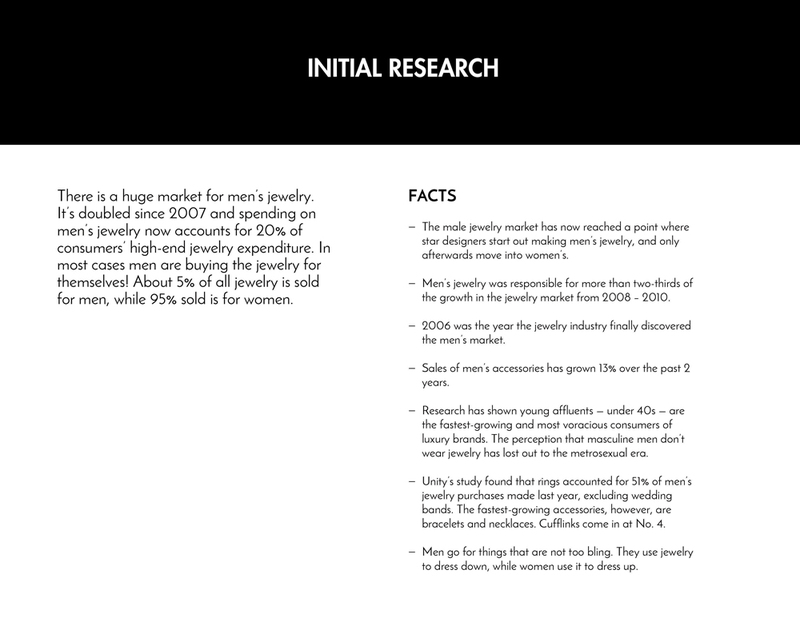 This extensive design project span weeks of researching the men’s jewelry industry, extensive user research, creating user personas, determining business goals, learning the desires and needs of a jewelry company, and finally creating touchpoints and messaging for an entirely new brand. This included creating a visual style for a market I didn’t know anything about before starting the project. Beyond that the scope of the project included a mood/style board, logo development, crafting brand guidelines, creating a stationery suite, packaging design, photography, art direction and a responsive custom Shopify site. Brand elements work together to visually communicate a modern/crisp aesthetic that highlights the pieces of jewelry and the designers that created them. The brand is about the reduction of elements. It creates memorable communication by avoiding visual clutter and utilizing negative space. The Signet brand highlights and emphasizes it's high-end products through the use of simplistic and clean design. The brand tone is sophisticated, high-end, crisp, refined and dignified. The Signet identity is about luxury and recognition. The logo is to be seen as a delicate piece of masculine jewelry. Signet is the unique specialty store through which men's jewelry lines are curated. It's minimal color palette and design style should not distract from the jewelry lines of the designers. The jewelry designers and their work make up the soul of the company. Signet was a project born from a challenge. I asked a group of my design peers to write down ideas for products or companies that I could brand. I then choose the project I felt like I knew the least about and developed a entirely new brand and company out of just a few words on a page. The process was a long one but seeing the brand start from just a few words and developing into a fully branded identity suite and corresponding website was so rewarding. I built the fully responsive custom site in Shopify.